Often times these resorptive lesions aren't immediately obvious in your cat's mouth. Often they appear as a lighter pink area in the enamel surface of a tooth, sometimes you'll see that the gingiva ("gums") near the affected tooth has grown up onto the tooth surface to cover over the area of resorbed enamel. 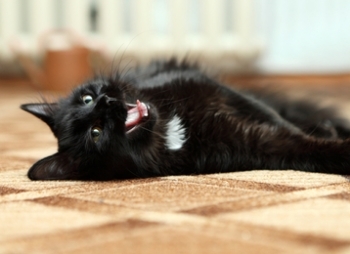 Frequently pet owners don't notice anything abnormal on their cat's teeth, or even anything obvious in their behavior. Sometimes they just notice that their cat maybe has started excessively salivating, has gone off their food, or perhaps they notice their teeth chattering. These are all potential signs of pain in cats, which could be related to their teeth or to any one of several other areas of their body. Find out more about what causes pain in cats. Estimates suggest that approximately 60–75% of cats over 5 years old will develop at least one resorptive dental lesion in their lifetime. Tooth resorption in cats is very common! The gradual, subtle, and painful nature of these lesions underscores the importance of paying attention to your cat's dental health, and of bringing them for regular dental evaluations with your veterinarian. It also underscores the importance of anesthesia in pet dental care and the taking of dental x-rays, both to allow full evaluation and care of the tooth and associated structures below the gumline. It's also important to note that cats who develop one resorptive lesion are unfortunately at high risk of developing additional ones, too. For more information on feline tooth resorption check out this article by Dr. Dale Kressin, a board-certified specialist in veterinary dentistry based in Wisconsin. And please, if your pets — both cats and dogs — haven't been in for a dental evaluation (and cleaning, if necessary) with your veterinarian recently, please take the time to bring them in soon. After all, February is National Pet Dental Health Month and resorptive lesions aren't the only problem affecting the dental and overall oral health of cats and dogs. And most of these conditions, including resorptive lesions, can only be seen, fully evaluated, and properly treated by your veterinarian.